In most of the patients with chronic hepatitis B and C, the disease progression to liver cirrhosis and a liver transplantation is necessary. Untreated oral diseases (including dental problems) can lead to infections and sepsis and may cause many complications in transplanted patients and a prerequisite dental evaluation is usually recommended for potential organ transplant candidates. Our aim was to determine the dental status in patients with chronic liver disease, knowing that liver transplant will be a life choices. Key words: dental status, liver disease, future transplantation, oral health. 1. Anand A., Pardal P, Sachdev V. Dental caries and periodontal disorders in chronic liver disease. 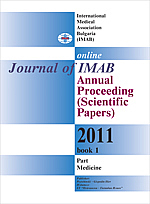 Medical Journal Armed Forces India. 2001 Jan;57(1):26-30. 5. Krastev Z., A. Kisselova, R. Kolarov. In: Oral medicine, I. Sapunjiev EOOD, Sofia, 340-350 (in Bulgarian).